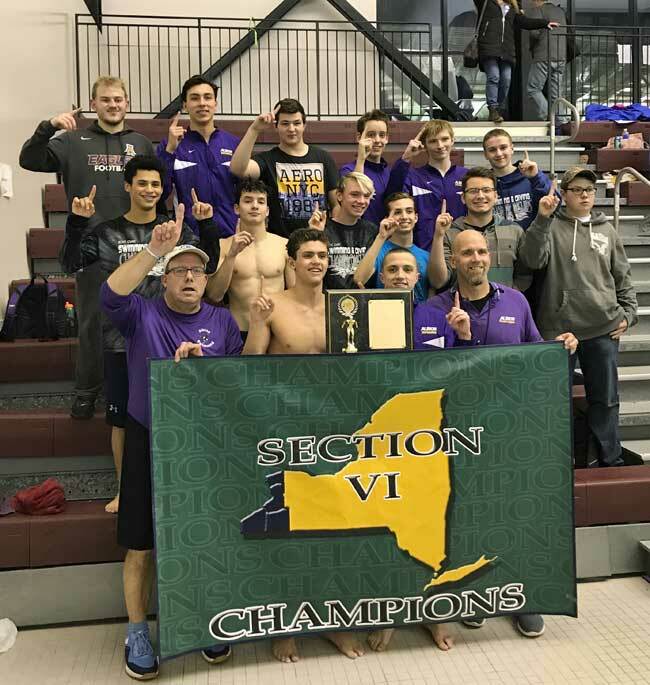 Contributed Photo – A happy group of Albion coaches and swimmers celebrate the Purple Eagles earning the Section VI Class C co-championship this evening in competition held at City Honors. Taking first place in five events, Albion earned co-champion honors with Frewsburg at the Section VI Class C swim championships held this evening at City Honors. Albion and Frewsburg finished the competition with identical scores of 286 points. Matt Kovaleski was a double winner in the 50 Freestyle and 100 Breaststroke and Sam Sanchez captured the 100 Butterfly for Albion as Harrison Brown added a second place finish in the 100 Free. Kovaleski set a new school record time of 1:04.8 in the Breaststroke as did Sanchez in the Butterfly with a time of :55.6. The Purple Eagles also took first place honors in the 200 Medley Relay with the foursome of Thomas Furmanski, Kovaleski, Sanchez and Ryan Krenning and in the 400 Free Relay with the quartet of Sanchez, Brown, Kovaleski and Chase Froman. Medina got second place finishes by Hunter Heil in the 100 Backstroke and Ray Paull in the 100 Breaststroke. Heil and Paull also teamed up with Isaac Pace and August Pietrafesa to take second in the 200 Medley Relay.